Thats really gets my goat! haha! Lovely friendly photo. Did you get to fed him? Bless hime! Wouldn't want to get any closer to those teeth! Great picture. Can't wait to visit the farm again this year. Had you just said "say cheese"?!! Hello, folks. Have you brought me any treats? Looks like his posing for the camera! I love the teeth too! love the picture! it brought a smile to my face this morning!! I found you through the Sunday social blog hop, and am now following you through GFC.....can't wait to read more! Love the picture! It made me smile!! I found your blog through the Sunday social hop, am now following you through GFC....looking forward to reading more! 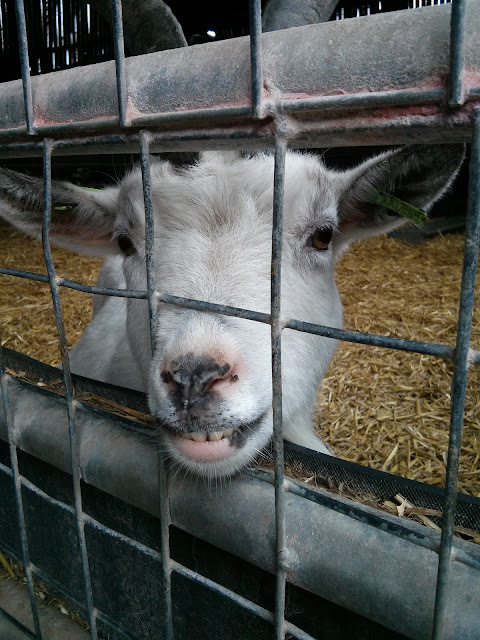 Our goats are just as friendly, brave up close picture as those teeth look ready for action. Teeth had a good go but I was too clever this time! did that girls like him? A fun day at the petting zoo? What fun! I found you on the Sunday Social. Thanks for cohosting. I'm your 400th follower! Woohoo! Love that smile! I am following from Social Sunday! What a great picture. It brought a smile to my face. Goats are just so much fun aren't they? Thanks for co-hosting Social Sunday. I am already a Follower of your Blog. I live in a rural area of Jamaica on a farm. Our neighbour has a lot of goats. Great shot! Take care and have a good week. Thank you, I already follow you too! New follower from What's Cooking in the Burbs. Thanks for co-hosting! Have a great Sunday! Aww, what a cute picture. Hehe what a great portrait!